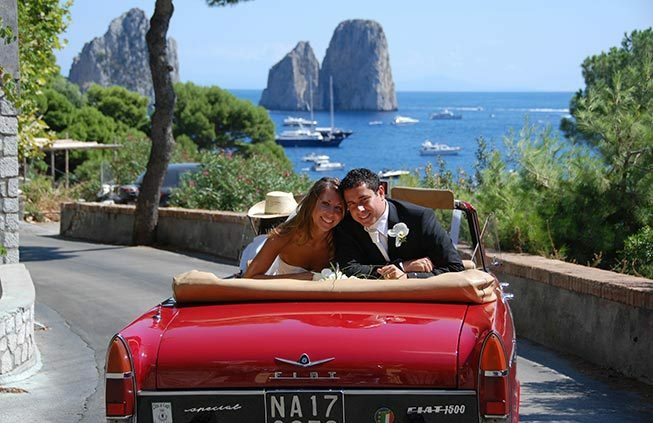 Choose a destination wedding in Capri. It has been said that "there are more myth and history in a small wave of the Mediterranean than in the waters of all the other oceans". And certainly the small island of Capri is the quintessence of the Mediterranean, the place where myth and history are still alive and talk to us. 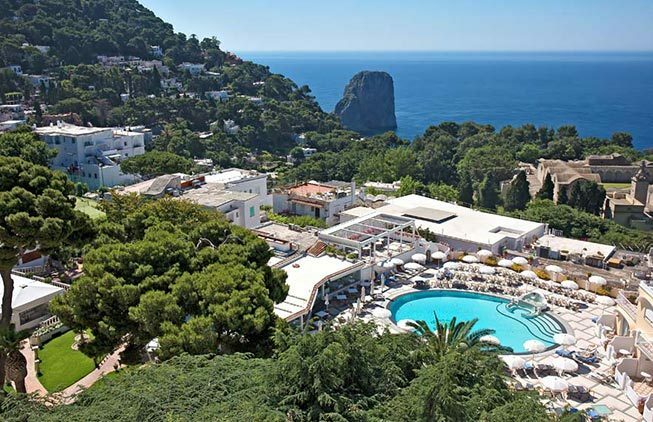 Inhabited since prehistoric times, Capri was a favorite resort for the rulers of the ancient world, the Roman emperors Augustus and Tiberius, who built magnificent villas overlooking its incredible vistas, and gardens full of fragrant flowers whose remains are still visible today. Romantic travelers chose Capri for their Grand Tour: writers and painters like Goethe and John Singer Sargent. Another German painter, August Kopisch, is maybe less famous as an artist but plays an important role in the history of Capri: thanks to his ability in swimming, in 1826 he rediscovered the famous Blue Grotto, a true natural wonder with its azure waters, which was known in ancient times but had been long forgotten. This discovery made the isle of Capri famous all over Europe. The isle of Capri has two souls: one is silent, secluded, contemplative, the other is friendly, a bit noisy and lighthearted. These two different souls are embodied in the two towns, Capri town with its glamorous little square, the Piazzetta, its first-class hotels, excellent restaurants and boutiques, and Anacapri, an excellent getaway for walks to the splendid villas Damecuta and San Michele. 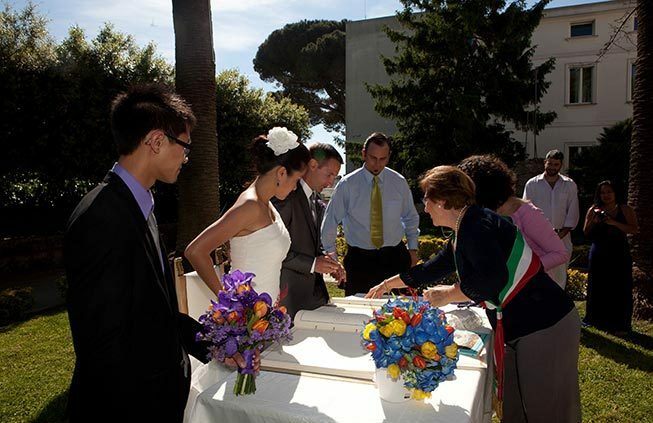 A wedding in Capri is an excellent choice for couples wanting a different and exciting destination wedding. 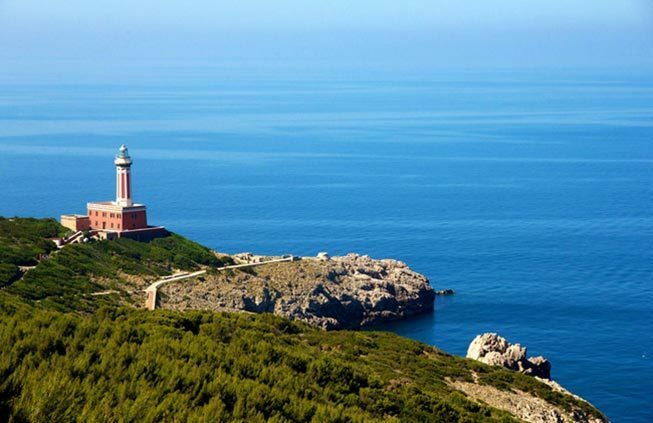 It is important to know that the island is located one hour distance by hydrofoil from Naples. If you are looking for a wedding planning company, who really want the very best day for you, as much as yourselves, look no further than Exclusive Weddings Italy! Taryn and Brendan, Wedding in Capri. I am still dreaming of the whole weekend and how magical everything was. Get married in the fabulous island of Capri. The most lively and fashionable gateway of the Mediterranean, the Island of Capri offers splendid romantic venues for traditional Italian wedding ceremonies. 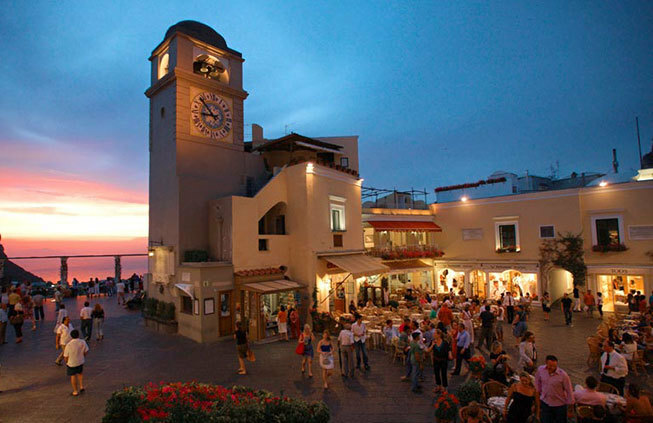 The town hall of Capri is located in the very heart of town, facing the famous Piazzetta. Civil marriages are performed by the Mayor or civil registrar in a marriage hall that can take place up to 40 people. The town hall of Anacapri is located in the highest part of the Island of Capri. An area of wild natural beauty and spectacular vistas of the sea and island. 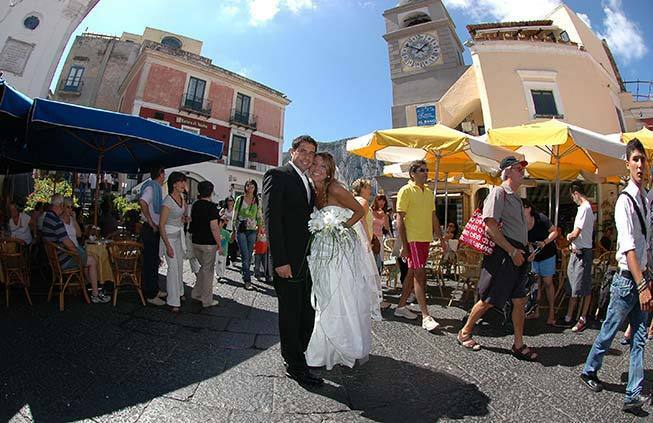 Catholic weddings in Capri are permitted only to residents of the Island. therefore couples wishing a Roman Catholic ceremony in this island blessed by the sun should consider to arrange a wedding in Positano, which is about 45 minutes ride by hydrofoil. 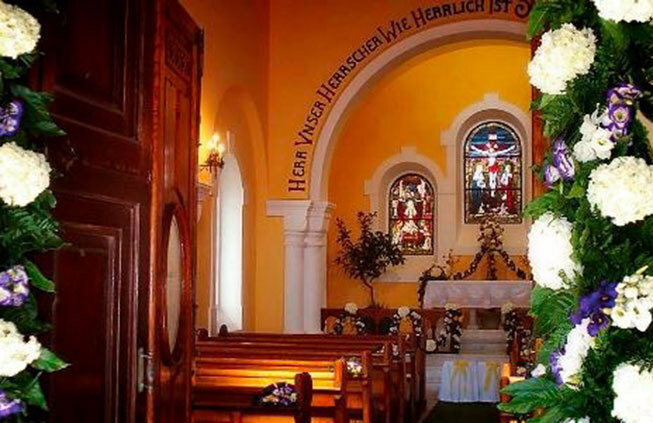 Protestant weddings in Capri can be performed in a small delightful Protestant church located in the heart of town, a few minutes walk from the famous Piazzetta and fashionable streets. Wedding ceremonies can take also place open air, in the roof-top of a luxury hotel or in a panoramic terrace overlooking the sea. 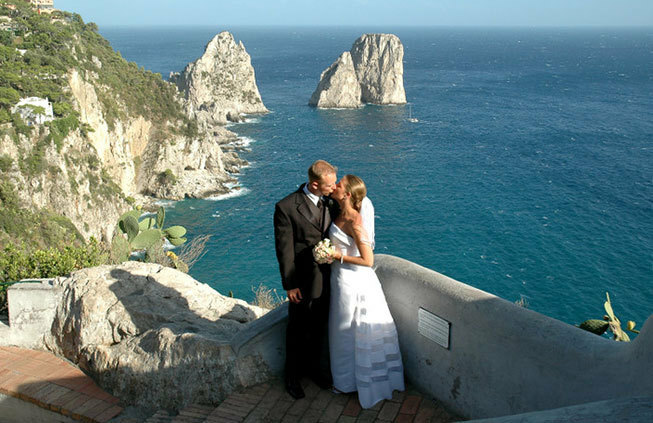 Capri is the ideal place where to arrange a romantic symbolic wedding. The island, with its fabulous luxury hotels, panoramic terraces, luxuriant gardens overlooking the sea is perfect for this intimate and private wedding ceremonies. Any kind of wedding reception can be easily arranged in this lively and spectacular island. Whether you are planning a romantic candle-light wedding dinner or an extravagant wedding reception, this location offers the best you can desire for a perfect wedding celebration. 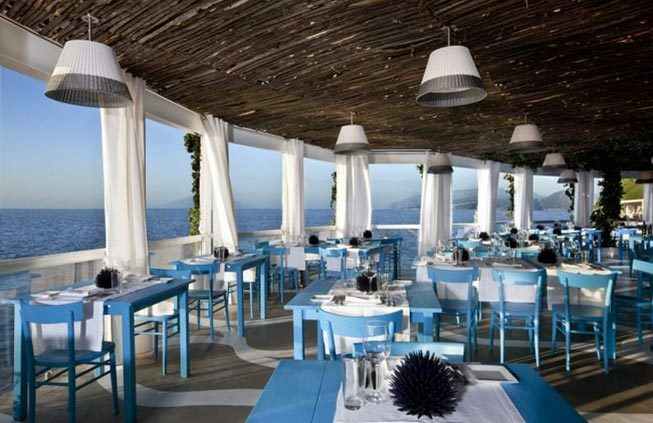 Wonderful sea-edge restaurant and elegant beach club perched on the cliffs, just a few meters away from the famous Blue Grotto or Grotta Azzurra. The restaurant interiors feature refined and classic Mediterranean furnishings with painted majolica tiles and a very vibrant white and blue color scheme. The simple and traditional soul of this restaurant has remained untouched and offers countless authentic flavors and a genuine cuisine of the Mediterranean Sea. This elegant hotel surely ranks among the finest in Italy. It is located only a few minutes walk from the fashionable Piazzetta, central to many key atractions and landmarks of the island. The ambiance is refined, relaxing, the décor stylish, with marble floors, chandeliers, oriental carpets, and white couches in public rooms leading to charming kept gardens accented with cypresses, pine and palm trees. 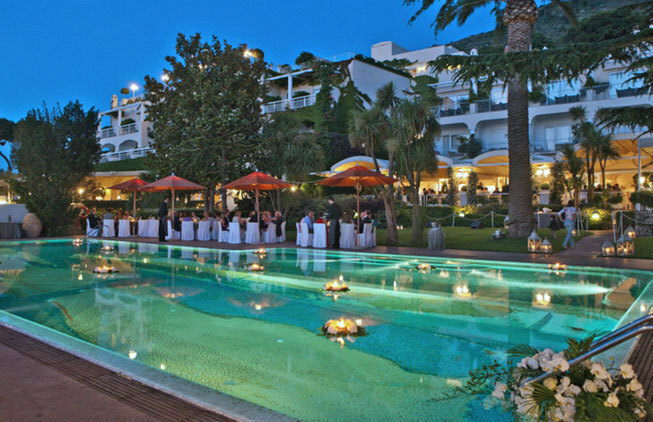 This exclusive retreat is certainly the right choice to host successful events and wedding receptions in Capri. 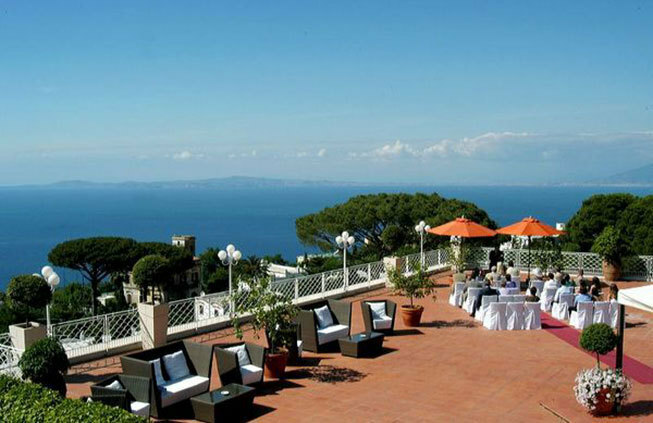 A modern resort atmosphere pervades this unique Mediterranean style hotel set in enchanting gardens in Anacapri on the famous island of Capri. This is one of the leading hotels in the work with a really enchanting contemporary style thanks to its exclusive art collection. The stone floors, the arches, columns and vaulted ceilings recall the typical architecture of the Mediterranean palaces of the 18th century. 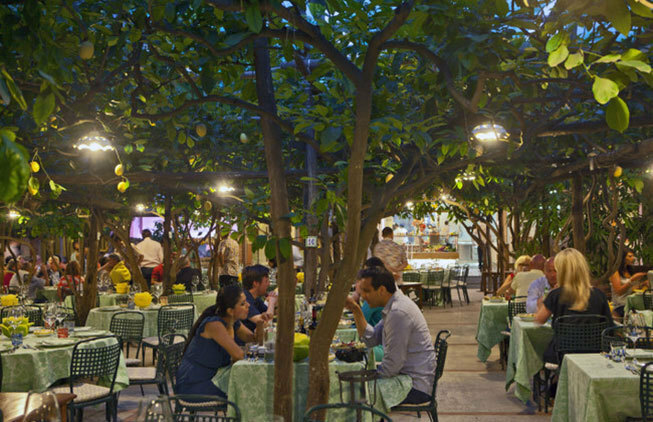 One of the great places where to eat on the island, easy walking distance from Marina Grande harbor and a few minutes drive from the heart of Capri. Perfect for rehearsal dinners and informal wedding banquets, this exceptionally romantic restaurant is renowned for its excellent food and wine served on a large terrace under approx 130 fragrant lemon trees, a really enchanting corner of the island. A truly unique setting for your unforgettable Wedding Day in front of the crystal-clear water of the sea surrounding the island of Capri, by the majestic lighthouse at just 10 minutes drive from Anacapri on the western end of the island. Festivities can start with a water-edge aperitif served as the sun sets on incredibly scenic terraces and sundecks set among the rocks, dinner can go on in the covered terraced restaurant ending with a cake by the pool enlightened by torches, candles and fireworks and dancing till early hours. This venue can host up to 200 guests.